I remember hearing the reactions when the trailer for “Fracture” came out: “So, what, is this ‘Hannibal Lecter V’?” I’ll admit, even I came to that conclusion upon gathering the plot of the film: Anthony Hopkins plays a deranged murderer of frightening intellect and outstanding manners who outwits police officers struggling to put him behind bars. But once again proving that there’s more to Hopkins than “that guy who was in ‘Silence of the Lambs’” he manages to play a villain of the same archetype who is considerably different from his most famous role yet still intriguing and entertaining. Good show, old sport. After discovering his wife (Embeth Davidtz) having an affair with a Los Angeles hostage negotiator (David Strathaim), wealthy engineer Ted Crawford (Hopkins) shoots her in the head, placing her in a coma. Crawford is then taken into custody and delivers a signed confession, leaving hot shot lawyer and compulsive winner, Willy Beachum (Ryan Gosling), to take the case. However, shortly after putting his new career at a topflight law firm on the line, Willy discovers that all the evidence obtained at the scene of the crime and from Crawford himself (including his confession) are null and worthless. Crawford seems to have planned everything far in advance and if Willy intends to put this psycho away, he’ll have to out-think him. This is one of the better mystery-suspense films I’ve seen in recent years, thanks in large part to the interesting twist in the plot. You know Hopkins shot his wife, they show it to you. However, what you don’t know is how he disposed of the evidence (even though, of course, all the clues are laid out before you). Half the fun is watching Hopkins outwit his opponent through clever loopholes and seeing Gosling squirm under his thumb as he struggles to locate substantial evidence Hopkins hasn’t already taken care of. Like any good script, the execution is almost entirely in the hands of the cast assembled for the task. The selection was excellent, with each character drawing me into the experience without missing a beat. Crawford is calm, cool and collected with a dark edge to him, but unlike Hopkins’ other psychotic alter-ego, is much less on the crazy side. He never once loses his temper or does something outrageous, yet Hopkins delivers a performance with all sorts of humorous quirks and gags that make you just love the villain. Gosling should not go without credit as the film’s hero. The character of Willy Beachum is a compulsive winner, which is both his greatest strength and weakness. His inability to accept a loss or back down from a challenge plays him right into Crawford’s hands while simultaneously plowing his life into ruin. He shows some real character progression throughout the film as he struggles with various morality issues (just how badly does he want to win) and learning not to be so arrogant. There was honestly nothing wrong with this film. 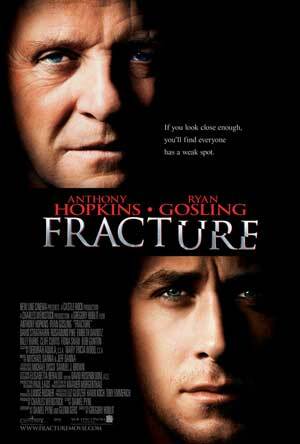 If you like mystery suspense films of the low-key variety (as in, no explosions) then you’ll enjoy every minute of “Fracture”. A great cast, a strong script and some very satisfying pay-off.